Access routes that allow people to explore without trampling on plants or wearing out the grass should be as good looking as their surroundings. A width of at least 1.5 meters is suitable-enough to allow two people to walk comfortably side by side. Curves are attractive, but not if they’re hairpins or too serpentine. Concrete was once the prime material for walkways but most of us have wearied of its uniform, bland appearance. In the following section are some ideas that give a more natural look while doing an efficient job. A spectacular effect can be achieved by building a raised platform suspended from 75-100 mm treated pine poles and finishing the surround with river gravel and plants. 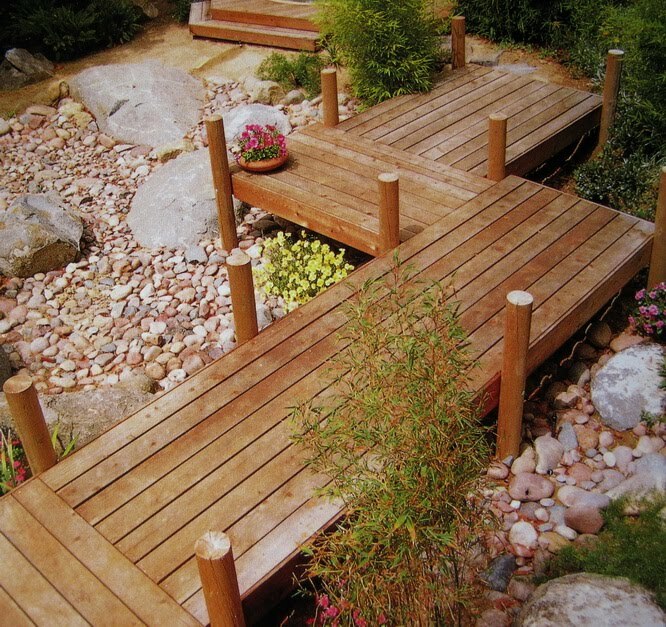 The beams and decking can be of hardwood or treated pine. You can span up to 1800 mm between the pine poles, they are secured to the beams with 12 mm diameter galvanised steel bolts. The walkway should be a minimum of one meter across (1.5 meters is ideal)-wide enough for two people to walk abreast. The cross members are sknew-nailed o the beams. On a slopping site, step down in 150 mm drops for ease of walking. Love that raised walkway, Lina!I would love to have one in my garden. wow! this idea of a walkway design is so nice! i can copy it for my future renovation/landscaping of our garden :D i'm following this blog of yours too.